The following are detailed specifications about the LED Mini-Pendant Light in Black. Minimum Hanging Height: 7.1 in. Maximum Hanging Height: 199.1 in. Chain / Cord Length: 16 ft.
Modern black small pendant light with clear shade. 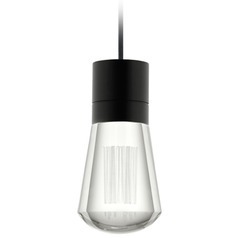 This LED Mini-Pendant Light in Black is part of the Alva Collection from Tech Lighting. The following items are also part of the Alva Collection.